(Pu’er, Yunnan—Jan. 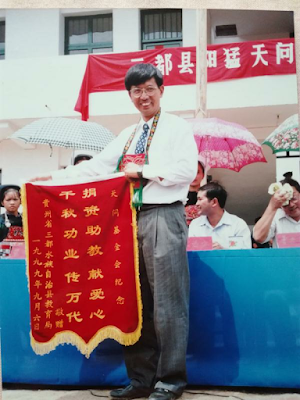 23, 2019) A court in China’s southwestern Yunnan province recently delayed the appeal hearing of an imprisoned North Carolina pastor once more. Pastor John Cao, who is married to American citizen Jamie Powell and whose children both reside in the United States, is currently attempting to reduce his seven-year sentence for “organizing illegal border crossings” by appealing to the province’s Pu’er Intermediate Court. The court had delayed the hearing before and scheduled it for Jan. 22. On Jan. 10, it issued a notice that the hearing will now be held on March 22. Cao was taken into custody in March 2017, as he and a Christian colleague, Jing Ruxia, were crossing from Myanmar into China, a trip they made often and with the knowledge of the officials due to their missionary work in Myanmar’s Wa State. Officials seized them both on illegal border crossing charges and later altered Cao’s charge to “organizing illegal border crossings.” In March 2018, he was convicted and sentenced, and Jing, who had already served her sentence at the time it was administered, was allowed to go free. However, Cao and Jing’s arrest was likely not due to criminal activity but rather their faith. After they were imprisoned, a Chinese-backed militant group began sweeping through Wa State and persecuting the Christian missionaries located there. While serving in Myanmar, Cao founded schools for more than 2,000 impoverished minority children and became well-respected for his contributions to their education. As a result, ChinaAid urges the Chinese authorities to immediately and unconditionally release Cao and allow him to return to his work in Myanmar. ChinaAid exposes abuses in order to stand in solidarity with the persecuted and promote religious freedom, human rights, and rule of law. If you wish to partner with us in helping those persecuted by the Chinese government for their beliefs, please click here to make a charitable donation.